All European users (yes, the 4 or 5 millions of them) received today a nice email from Linden Lab with an unexpected "surprise": starting immediately, all European residents will be charged Value-Added Tax on their purchases from Linden Lab. So is Linden Lab being very nasty with the poor European users, that suddenly saw their expenses going up, without explanation (not even an official blog post!)? Is LL tired of the growth in Europe? Are they afraid that content creators and landbarons in Europe are too successful and wish the rest of the world to get a chance to catch up? Following changes introduced on 1 July 2003, (under Directive 2002/38/EC), non-EU businesses providing digital electronic commerce and entertainment products and services to EU countries are also required to register with the tax authorities in the relevant EU member state, and to collect VAT on their sales at the appropriate rate, according to the location of the purchaser. Alternatively, under a special scheme, non-EU businesses may register and account for VAT on only one EU member state. This produces distortions as the rate of VAT is that of the member state of registration, not where the customer is located, and an alternative approach is therefore under negotiation, whereby VAT is charged at the rate of the member state where the purchaser is located. So Linden Lab is just really complying with European Law. And yes, they have no chance but to comply, if they wish to keep those 4 or 5 million users! VAT is only charged to the end customer. If you provide services and/or goods, you charge VAT, and your own suppliers charge VAT to you. As a service/goods provider, you can subtract one from the other, and have a running account with your local revenue service. In effect, you only pay VAT to the State if you provide more services than the ones you buy (most successful businesses will, of course, be in that situation). Thus, for a company or a self-employed individual, it's good to be able to get VAT charged to you, since you can now use that VAT to deduct from your regular (monthly, quarterly, or yearly) accounting with the revenue service. More interesting than that: you can now file your expenses with Second Life (assuming you're drawing an income from providing services in SL!) as operation costs, thus, this means less income to be taxed on personal revenue. Getting billed with VAT is thus a double blessing — less VAT to pay, less revenue taxes to pay. For end-users — ie. employees (or unemployed people), retirees, etc. — things are quite more unfair. They cannot deduct VAT from the services they acquire; they cannot use expenses with Second Life as "operation costs" whatsoever, it's a service they're buying for their pleasure and enjoyment, and thus taxed as a "luxury" item (between 15-25%, depending on the EU country you're in). What does this mean for the regular resident? Well, if you have little land, you have no choice really — Second Life will be more expensive for you. Very likely, European residents will simply tier down to Basic and pay in L$ for plots on private islands run by American landbarons. On the other hand, if your business (content or land) is considerable — ie. earning more than €2000 or so per month — it's very well worth becoming self-employed, and start cutting down on taxes! Hi Gwyneth! The odd thing about this explanation is that in Europe, as a private person, when you buy something, the VAT is included in the net price that is stated on the product, price list or whatever. It makes no sense that on the prices that are being communicated VAT is added. IT does make sense that, when you hold a company, you can deduct the VAT from the net price. It would be the same idiocy that I, being a dutch citizen, when I buy a pair of shoes in Germany, where VAT Is lower than here I believe, I would have to pay an extra 2% to match "my" VAT rate. NO, I pay the same price as the german client, and the merchant pays the VAT that is included in the retail priced already. Relocating VAT is possible, but only for wholesale purposes. Retail should not be affected with this. And another thing: LL sent an email about 8 hours AFTER implementing this charge. I would have appreciated a warning several weeks before. Then I would have reconsidered buying more land and upping my tier. The email was sent at 1 a.m. btw. I can Babbage was working really really late? Indeed, communication is key once more. This post should have come from Linden Lab somewhat earlier on the blog. And interesting enough I was talking just about taxes and invoices in an office hours some hours before that mail came in. No mention if any changes there. Ok, if I have to pay for something to LL with my EU credit card, I'll have to pay a VAT on it. But what if I pay pay it from my USD balance, with USD that I got from selling lindens ? In this case I really wonder how the added value can be justified ? Could some kind soul point me at the Linden Lab VAT Registration number? If they are collecting VAT thay need to be VAT registered, after all. I would just like some actual proof. Another point I think deserves clarification. As this has been EU law since 2003(? ), when are LL going to come after your back taxes? After all, if it needs to be paid now... it must've needed to be paid in the past. Yay ! Once again, what an amazing lesson on "How to communicate with your customers", huh ? LL surely ought to write a book on that, being such experts on this subject ! Most of us are just final consumers indeed. Our pieces of land are just part of the fun... so maybe it's time us lil common people migrate someplace else and leave the companies and entrepeneurs doing business among themselves while we just relax and enjoy our leasure time at the end of the day !! "But on the other hand, if you're self-employed or a company (even a one-person company! ), this will be a blessing." No, really, it isn't. Remember that the VAT is added on top of the retail charge in this case, it's not part of it. Option 1 is for VAT-registered entities to ask Linden Labs for VAT invoices and then claim the VAT back from their governments several months later. What fun! Option 2 is to put your VAT registration number into the Linden system to prove that you are entitled to be billed the ex-VAT amount. Then you're back to exactly where you were. Net effect in both cases is zero, plus paperwork. Not a blessing. Oh, and the Linden system to verify VAT registration numbers is broken right now anyway. Hardly ... if you go "commercial" on your SL activity and declare everything, it means you have to start *charging* VAT to all your customer in the EU too, not to mention including everything on your income tax. Zero financial benefit, and a *huge* administrative hassle. It will be only a blessing if you get an invoice from that damn company, but then they know all about you too. Ok would not be a problem, but as it seems, LL is not even able to let you put in your EU VAT number - service failed. I guess whole LL failed once again. Ah, we need an accountant to figure out things correctly :) Anyone? @Grazia, indeed, if LL is doing business in Europe, they should state that their prices are "including VAT". If you go to https://secondlife.com/account, you'll see it now properly states that all prices will include VAT. @tooter: sending out 4-5 million emails, and avoiding spam filters, takes several hours. Trust me! You could do it in "minutes" and get blocked by all major mail servers in an instant. But sure, I agree that they should warn first, implement later. Note that they don't need to be registered in the UK to invoice with VAT in the EU — they can apply for an European VAT number straight out of the US (ie. being physically located in Europe is not a requirement; having a valid VAT # to bill European users is!). I just suspect that they made this move to add VAT now simply because that now they have their offices in Brighton fully operational, they are under "control" of HMRS, and they have to be more careful about "loopholes" for European users. As for "back taxes"... complex :) Very complex!!! In effect, what this means is the following: every time you got a bill from LL in Europe, you would be required to file it on your accountancy with VAT reverse-charged, ie., voluntarily paying your state's Revenue Service the VAT that wasn't charged to you. I know this is pretty much ignored in most places — if the values are low, you just never do the accounting for the invoices you got from the non-EU space. But, well, that's technically "illegal" (a small form of tax evasion!) but unless we're talking hundreds of thousands of unaccounted €, I seriously suspect nobody would care much :) (I have never met a company that did reverse-charging of VAT from non-US invoices... but I suspect that import/export operations are way more careful than, say, a regular service provider somewhere). I wonder what the dozens of thousands of European non-profits (think schools and universities) will make out of this — perhaps the system does work for them, I don't know. @magical, now this depends a bit ;) If you have a commercial activity of any sort, you most definitely need to file tax forms for it, and obviously emit invoices for your customers too! It's not up to me to tell people that they should be nice, law-abiding citizens or not (really, that's not the issue, and up to everybody's conscience), just that if you're providing services in Second Life, you should be doing that legally... but if you don't, it's up to you! So I just meant it's better (or at least easier?) for people already doing things legally. Obviously it's no fun at all for end-users who don't want to register themselves as freelancers (eg. because they're already employed, and have an exclusivity agreement with their employees) much less starting their own microcompany just to earn a handful of € with their SL-based services. For them, this is a nightmare — SL just became more expensive for them. "...if it's below a certain threshold, doesn't require regular accounting." You are referring to automatic VAT exemptions of businesses below a certain size. But in this case, you can't receive VAT refunds either! You are effectively the "end customer." "On the other hand, if you already are a freelancer (or have a small company), you can put all the expenses with Second Life, Internet, computer, etc., as operational costs." Good luck with the tax authorities. They will love hearing your explanation of why you need SL as a business expense. No, Gwyneth, if you live in the EU and really want to take the "nice and legal" approach, this means you have to start *charging* VAT on everything you sell. Selling a shirt for L$150? You have to determine if the buyer lives in an EU country, then charge the appropriate VAT. Didn't charge it? You are still liable for it. Magical, referencing a L$150 charge is inappropriate because only game tokens are being exchanged at that point. There is no VAT on L$ exchanges. The VAT only occurs when real currencies are exchanged. Dirk, good point ... but it leads to the next issue, which is that if you are not taking real money out of SL, you have a hobby rather than a business and cannot claim VAT refunds ... and if you *are*, then unless you can prove that it coming from outside the EU, you presumably have to pay the VAT on this out of your own pocket. So LL will collect the VAT and distribute the VAT. They obviously have some idea of where people are so that the correct states get paid. As a small company operating a business within SL it makes me wonder HOW I would do the same IF I were so inclined. When I complete a transaction in $L with any avatar, I have no way of know who is driving that av or where they really reside. Let's say, for some strange reason, I REALLY wanted to collect and distribute VAT. Could I (or the EU) compel LL to provide me with detailed information on each resident that transacts with me so that I can also comply with the laws? Gosh, Gwyn, I love how evil American land barons are suddenly to blame for the need of Europeans to pay for their socialism via heavy taxation. I still have not seen a statement one way or the other about LindeX. I would argue that it is a service, selling "play money" by LL to you, the punter - and therefore liable. I hope not - but it would not surprise me. Thank god for American friends! I think LL should "grandfather" sims owned prior to the effective date and absorb the VAT themselves. They are still getting approx. USD 250 net, which is considerably more than the USD 195 net for mainland sim or previous grandfathered sims. Rationale: Fairness. LL "sold" these sims on a certain basis which they should stick to. This change is *not* due to any recent change in law but rather LL's decision to apply existing laws in a certain way (not to mention their decision to open an office in Brighton). In fact, consumer prices in the EU are necessarily *inclusive* of VAT, so an EU resident buying a sim could reasonably have assumed that the prices (especially monthly land fees) are end prices. Instead, those who showed their confidence in SL by buying sims for renting out are facing losses, since most can't pass this on to their renters. Linden Labs by applying all of a sudden this new policy regarding VAT will probably cause the financial demise of most European sim owners, who will have to pay roughly 20% more for all sim related costs... causing the demise of their sims, witch in turn will cause the departure of many European residents who won't fit as well outside their language zone. Once again, some unconcerned residents explain us that that Linden are angelic beings victim of a bad world. But in fact, incompetence is neither good or bad… but can lead to bad things. In this case, they've opened the box of taxes, and I don't think most European countries will feel obligated by the TOS when they will attack Linden Labs. But taxing us they break several laws, among witch advertising a price for normal person (not a business) with a price not comprising taxes, not giving a proper tax receipt, and probably many other…. Add the fact that most country will probably ask to verify they pay this taxes, and where this taxes from preceding years are... that’s bad for Linden Labs, and for us as a community too. But before all, by doing so without giving us any time to adjust, they will ruin European sim owners, witch is destroying a community bases. This makes me sure of one thing: Linden Labs possess Second Life, but does not care for the community any more, except as a number to sell to businesses. That’s sad, because without community, Second Life is a lame game with a payment system. I'm still trying to figure out how businesses can put their VAT number in if L$ is exempt. You can't file for VAT registration if all your transactions are for VAT exempt services. If you put in a VAT number for a business that operates outside SL, surely that's fraud? Well, whole new kettle of fish. I'm sure the HMRS might well be interested in helping you with a UK court case to determine if L$ is real money, and I would have thought the fact you can convert them back and forth in various places gives them value, and that sales in L$ are therefore liable to VAT. That way, you can properly pass on the VAT to the end user as the law is intended. That makes it good for SL businesses and landlords who can pass through the VAT. It'll make it more complicated for Linden to account on every transaction, but tough lol. But OTOH that would make things so complex the authorities might decide that this law is a little stupid. If services are done this way, it's only a small step to enforce foreign companies to impose and pay VAT on goods they ship too, which would save money on agents at custome when you return from a trip. Secondly, I am concerned with changes without warning, and giving an option to cancel, that's a change to ToS which surely is a breach of contract. Thirdly, how much of LL's ToS is valid under UK and EU law, and can they keep changing it every five minutes on the web like they do, without notification, without that constituting a change in contract terms which might be illegal? 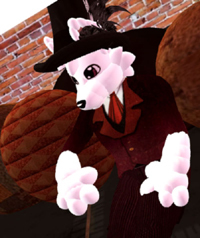 I have two theories on VAT for Second Life based companies which sell content. The first theory is that the business needs to collect VAT themselves, on linden dollar transactions. This interpretation treats linden dollar transactions as real monetary transactions that should be taxed. This means you can substract linden dollar expenditures from your income, so you'd need to pay less income tax too (separate from VAT). Treating expenditures as expenditures in the income tax sense is beneficial for SL business owners. I don't see how VAT matters in this theory, except for increased bureaucratic overhead. You also should be paying VAT on sales to EU residents. Since it's not possible for a business owner to determine whether someone is a EU resident a deal will need to be made with the tax agency on an estimate on how what percentage of customers are from the EU. Basically this means complying with tax laws means you need to pay a certain amount of your income as VAT. This means you make less money for your theoretical percentage of EU customers, compared to non-EU customers where VAT doesn't apply. This is that linden dollar transactions are not considered taxable directly. Only real dollar transactions are taxable. Since typically the only dollar transaction is with Linden Lab, and Linden Lab is collecting VAT, any subsequent content sales should *not* be taxed, as that'd amount to double taxing. There is no need to consider content sales to EU citizens for VAT purposes as tax is already taken care of at the gateway into Second Life. This makes life for business owners easier - there's no more penalty for sales to EU citizens. The drawback here is possibly that costs made *within* second life cannot be considered costs for income tax purposes so easily either. Do Lindex transactions also include VAT charges for EU citizens? That is, if I buy 10000 lindens with my credit card, so I pay VAT on this if I'm in the EU? If not, the situation is quite confusing: linden dollars gained from weekly payments because you have a subscription *already* have VAT included, but linden dollars bought through Lindex *wouldn't*. In that case, I have no idea what to do anymore. Robin Linden says "...and the bottom line is that we must charge VAT to EU residents in order to comply with EU tax regulations". of so called "advisors". Never forget folks - we are the one who create the content - it is time to kick arses! This is quite much more than you blogged Gwyneth! You need to look BEHIND the curtains to know the true nature. LL has been paying VAT all along, before this VAT was INCLUDED in the price tag. Now it is EXCLUDED. This means this was a cover up to raise prices for EU citizens. This brings NOTHING good, except for LL more profits! It's rather revealing and to the point. What LL is doing is illegal in MANY MANY ways. Hmm Anonymous, is it true that LL was charging for VAT before this announcement? You see, the issue is that their bills don't mention that (they do now), so in effect, a RL business getting billed by LL up to last month had no way to claim back any VAT — since LL's bills did not, in fact, include it anywhere, implicitly or explicitly. Assuming that LL is a honest company, I'm much more for the scenario where they weren't aware that they need to charge VAT to European customers, than believing a complex scam where LL deliberately mislead everyone (by not stating "VAT is included" on their bills to EU residents), kept that extra VAT, and never told us anything about it... that would be a far more serious tax fraud than saying: "oops, we forgot to charge you guys for some VAT, we're doing it now though". I agree with your assessment that LL will have been unaware of the need to charge VAT to European residents. This is a copy of the entire directive - and it is unambiguous about the requirement to charge VAT if you are a non-EU electronic services provider with EU customers. Introducing the VAT for providing SL to Europeans is just LL picking and choosing which EU and country laws to abide by. This is a tacit admission that they are also subject to all other laws where the Resident resides. I imagine a money grubbing lawyer is rubbing their hands right now and laughing at the nightmare that they have created for LL. Australia has the 10% GST on all transaction. Therefore LL has to collect and pay all GST to the Australian Government not the idividuals. Her is LL quuandry if I buy goods and services from the USA using a credit card I pay any State/Fed USA taxes, quite rightly included in the price, UT I DO NOT PAY ANY OTHER AUSTRALIAN CHARGES. Therefore as LL is based in the US why are VAT being levied. And it is illegal in Australia, as I am sure it is in Europe to say "plus GST" The price quoted is the complete and full price including GST. Also if LL is not collecting and paying then the transaction in SL have to be considered as being those of an Independant NAtion.